Taken off Lady Elliot Island, Australia. Reaching lengths of 3.5 metres, the Leopard shark is found at depths of 5 to over 30 m. It sits lazily on the bottom and is easy to get close to. This shark feeds mainly at night on small fish and molluscs. Its offspring hatch from large, dark brown, egg cases when around 25 cm. Found in the Indian and Pacific Oceans, including the Red Sea, Thailand and of course Australia where this photo was taken. Harmless unless provoked. The leopard shark is the only member of the Stegostomatidae (Zebra shark) family. 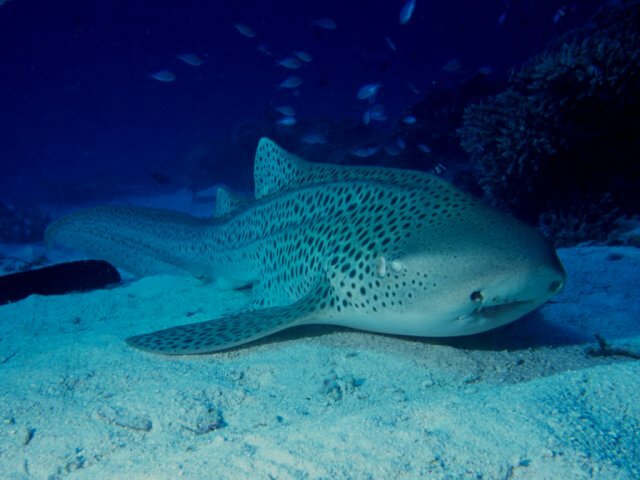 It's called the Zebra shark family as the juveniles are black with yellow stripes.